Grand Opening of Sunshine Learning & Care, Inc.
Sunshine Learning & Care, Inc. (Sunshine) welcomed Mayor Gary Christenson and members of the community for a Grand Opening ceremony at their recently renovated center at 165 Mountain Avenue. 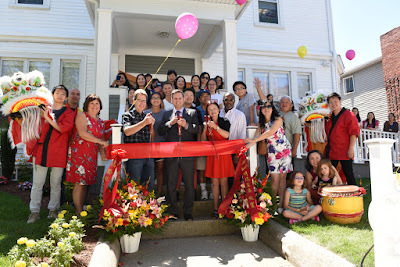 Sunshine Owners Xuli (Shirley) Huang Gervais and Ken Gervais are particularly proud that the Malden facility is their third location. Shirley and Ken have invested more than $700,000 in the nearly 4,000 square ft. Victorian era building. At full capacity, Sunshine Malden will enroll more than 100 children with diverse age groups and create more than 30 full and part-time teaching jobs. Shirley Huang Gervais came to the U.S. from China with her young teenage daughter and an advanced degree in Early Childhood Education. With more than 13 years of teaching experience she was once named “Teacher of the Year” in Fujian Province, China. She began work in a daycare center in Boston’s Chinatown, achieved her Director Certification in 2004 and has recently completed more advanced studies in Early Childhood Education. In 2007 Shirley and Ken opened the first Sunshine Childcare at 241 Harrison Avenue in Boston Chinatown, serving 29 children. By 2012, Sunshine expanded to a second location in the same residential Complex (Tai Tung Village) at 236 Harrison Avenue, with a capacity of 16 children. Shirley’s goal has always been to provide high-quality bilingual (English/Chinese) daycare service and good job opportunities for the Chinese American community. In addition to regular bilingual daycare programs, Sunshine Childcare III will also offer after-school, weekend, and Early Childhood Educator training programs. Sunshine is proud of their continued work to provide an important bridge for new immigrants’ financial self-sufficiency and career advancement by encouraging and supporting continual education and childcare training certification. They also sponsor peer-group support for over 20 family childcare providers in the Greater Boston area. Owing to the success of its unique and high-quality bilingual daycare programs, Sunshine has maintained a long wait-list, with clients drawn from local residents as well as families outside of Boston. Sunshine has a very diverse student base, and a multi-cultural teaching staff. 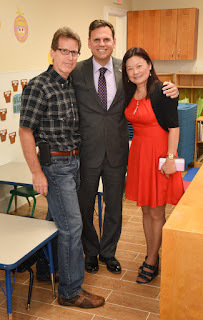 With the opening of their brand new childcare facility in Malden, both Shirley and Ken will continue the successful formula of high-quality bilingual education, coupled with a dedicated, well-trained, and multi-cultural staff. For more information, please visit www.sunshine-childcare.com or call 781-321-0858.